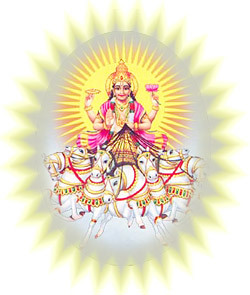 The Sun in Vedic astrology is called RAVI, or SURYA. He is considered to be mild malefic, in consideration of the hot, dry in nature. As in western tropical astrology, the Sun rules the Sign of Leo (Simha). He is exalted (Uccha) in the sign of Aries (Mesh), and he is in his fall (Neecha) in the sign of Libra. The Sun is known as the ATMAKARAKA. This comes from the Sanskrit ATMA meaning soul, and KARAKA meaning indicator. As "indicator of the soul" the Sun is the giver of life. The Sun is the indicator of the father, our ego, honors, status, fame, the heart, the eyes, general vitality, respect and power. The Sun is in his strongest placement directly overhead in the 10th House. He is also strong in the other Kendra's, or Angles. These are the Houses 1, 4, and 7. The Sun also does well in what are called the upachaya, or growing Houses. These are the Houses 3, 6, and 11. He is particularly beneficial for the fire sign Ascendants of Aries, Leo, and Sagittarius. His nature, or temperament is PITTA, or fiery, and the gemstone associated with the Sun is the red ruby. Sun characteristics: The Sun gives us vitality and the power of resistance and immunity. It is responsible for our physical makeup – the body's constitution. The Sun gives life force, the power of will, intellect, brilliance, prosperity, success in worldly affairs, wealth, personal, conduct, activity, cheerfulness, good fortune, wisdom, ambition, fame, the understanding of the phenomenal world, and the knowledge of medicine. It also governs our relationship with temples and holy places. The human spine is specially influenced by the Sun. Pingala Nadi, which represents the Sun, originates at the base of the spine on the right side, is solar in nature, and terminates in the right nostril. Sun Relations with other planets: The Moon, Mars, and Jupiter are its natural friends, and Venus, Saturn, Rahu (dragon's head, or the north node of the Moon), and Ketu (dragon's tail, the south node of the Moon) are its natural enemies. Sun Nakshatras: Kritika, Uttra Phalguni, and Uttra Khad are ruled by the Sun. Organs ruled by Sun: The Sun is connected with the right eye in men and the left eye in women. The Sun rules the heart, liver, lungs, head (brain), nerves, and bones. Sun diseases: An afflicted and ill-aspected Sun gives low and high blood pressure, indigestion, jaundice, cholera, fever, diabetes, appendicitis, hemorrhage, cardiac thrombosis, eruptions on the face, typhoid, tuberculosis, mental problems caused by thinking too much, diseases of the head, epilepsy, and disorders caused by aggravated bile. The Sun's metal is Gold and his direction is east. His day is Sunday, and he comes into full maturity and brilliance at age 22. He is the God-a living God-whom everyone can see, perceive and pray. Though he is visible, he also has been presented in a variety of forms. He is the life-giver and time-giver. The Vedas adore him as a witness (Sakshi) of all actions. He is the lord of Leo in the Zodiac. He stays one month in each Rasi and takes 365 days or 12 months to complete a round of 12 Rasis. Worship of this Devata (GOD) on Sunday is supposed to bring in manifold benefits to the worshipers. Sun religious significance: In the six sects established by Adi Sankara, Souram is one devoted to Sun God. Even in other religions, Sun worship has place. In the Zodiac, Sun occupies a prominent place-the Center. This graha is the source of life and he is therefore described as the life-giver-PRANADHATA. He helps one gain his eyesight and SURYANAMASKAR (worship by prostration) will strengthen one's bones, cure illness, however severe it may be, cleanses the devotee from his sins and bestows on him progeny, wealth, good-health and long life. He is the cause for rainfall benefiting the world.